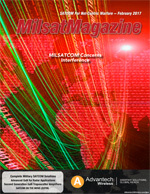 If you are a regular reader of MilsatMagazine, you may have already "seen" me banging the drum for why the military should be using Carrier ID to enable quick and easy resolution of satellite interference. With numerous examples in the news, there shoud be no surprise that cybersecurity attacks are on the rise. The United States Air Force is currently conducting a series of programs called the Commercial Satellite Communication (COMSATCOM) Pathfinders. Maintaining assured and reliable satellite communications links across both commercial and military sectors is critical—technology plays a big part in that endeavour.